The two overflowing spice cabinets (yes, cabinets, plural) in my kitchen, are a tell-tale sign that I have an addiction to spices. I see spices as a gateway to not only flavor-filled meals but also to other cultures and cuisines. That's why I was so drawn to the upstart company, RawSpiceBar. They make it easy to bring interesting worldly cuisines into your kitchen. 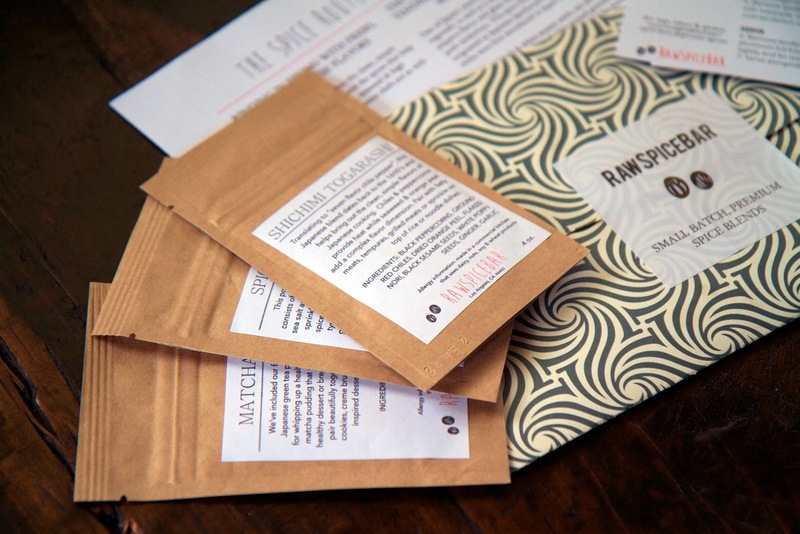 RawSpiceBar is a home delivery service that sends freshly ground, small batch premium spice blends to your door for $6 a month. RawSpiceBar's custom spice blends are toasted, ground and blended by expert top chefs from all over the world for maximum flavor. And, you don't just get the spices. Included each month: 3-4 freshly ground spice blends from one region or geography, enough to create 3 dishes serving 8-12 people; 3 kitchen-tested recipe cards plus additional recipes online, and spice blend tasting notes, origin, and history. And, every now and then you also get bonus spices, toasting tips, discounts, and other fun stuff. It all comes in a beautiful, simple packaging. They also offer quarterly subscriptions. For this review, the featured country was Japan. 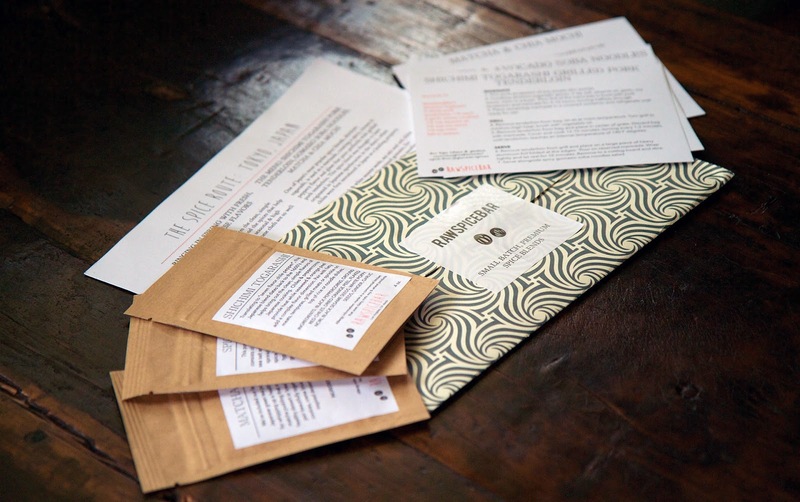 Each packet came with a description of the spice blend. SHICHIMI TOGARASHI - Literally translating to "seven flavor chili pepper", this Japanese blend dates back to the 1600's and brings out the clean, simple flavors of Japanese cooking. Chiles and black peppercorns provide heat while seaweed and orange peel add a complex flavor dimension. Pair with grilled meats, tempuras or sprinkle on top of rice or noodle dishes. 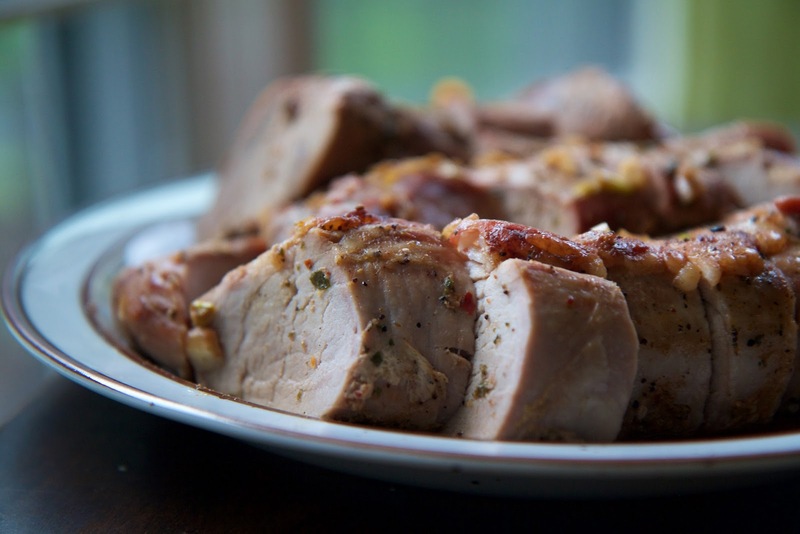 The recipe for the Shichimi Togarashi was grilled pork tenderloin. The marinade included the spice packet, mirin, soy, sesame oil, and fresh garlic. I didn't have mirin, so I substituted in a touch of sugar dissolved in dry vermouth. This dish was delicious. The spices provided just a hint of citrus and pepperiness. It was very juicy and tender. SPICY GOMASIO - This popular Japanese condiment simply consists of toasted black and white sesame seeds, high-quality sea salt and a touch of chiles for heat. Frequently sprinkled on rice and salad dishes in Japan, this spice blend can be used anywhere you would typically use salt- and is a very healthy replacement. Add to edamame, sautéed greens, eggs, soba noodles, popcorn or even as a crust for salmon or tofu. MATCHA + CHIA - Japanese green tea powder plus freshly ground toasted chia seeds for whipping up a healthy, antioxidant-packed matcha mochi that makes a light, clean and healthy dessert. These ingredients pair beautifully together and can be used for cookies, creme brûlée or any other Japanese-inspired dessert or sweet breakfast dish. 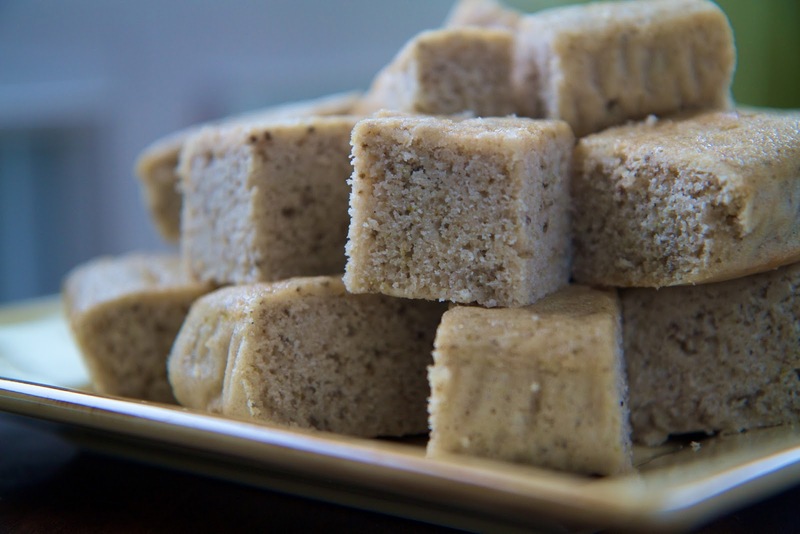 The recipe for the Matcha + Chia was mochi, a rice flour-based dessert. I didn't have white rice flour on hand, so I just went ahead and used brown rice flour instead. The color of the final product may not have been as nice, but the taste was delightful, not overly sweet. We enjoyed the leftover for breakfast the next morning. I will say that I think most of the included recipes made closer to 8 servings rather than 12. Not really a negative, just something to keep in mind. 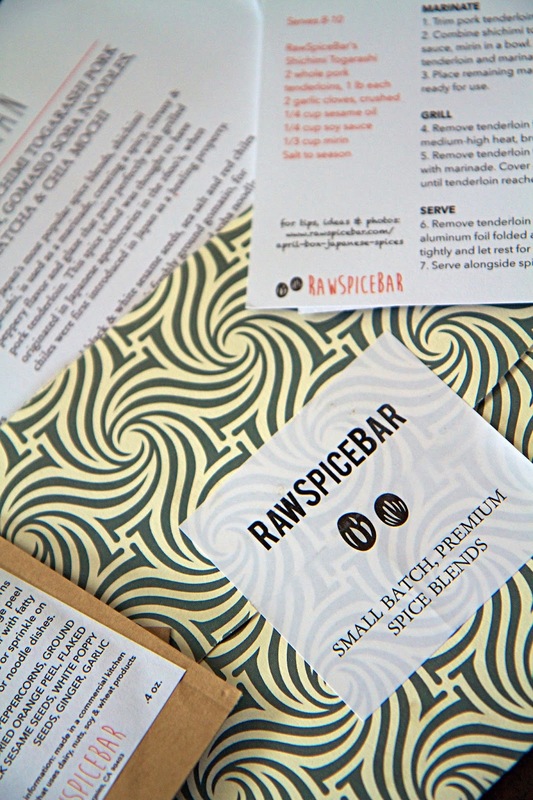 From the quality of the spices to the quality of the recipes to the clean well-designed packaging, I give RawSpiceBar a big thumbs up. If you're looking to explore the flavors of other regions and geographies from the comfort of your own kitchen, then this is a great service. And, for $6 a month, you can't really go wrong. I plan on signing up. If RawSpiceBar sounds like something up your alley, well stay tuned, because tomorrow I'll be posting a giveaway where one of my lucky readers will win a FREE 3-month subscription. Disclosure: I received one free month of RawSpiceBar to facilitate this review. I received no other compensation for this post and the opinions contained herein, are my own and reflect my experience with the products. Your own may differ.